“Libraries will be extinct by 2020.” That’s what North Texas Regional Library System (NTRLS) Executive Director and self-proclaimed futurist Adam Wright said during his keynote speech at the NTRLS conference in Decatur, Texas this past Saturday. He was paraphrasing what fellow futurist Richard Watson had said regarding the future of libraries. There has to be some strong opinions on this one. So here’s your chance to sound off in the comments! And speaking of extinction of things, Watson’s extinction timeline is on fellow lover of libraries Christine Rooney-Browne blog. As far as the conference went, I suggest, fellow book-writers, run, don’t walk to your local library, do whatever it takes to get your librarian to contact their regional local library supporters group on your behalf and wrangle up a table at their conference. There was so much good information, from using social media to promote books, to promoting things on a shoestring budget. Here’s the link to the site where they have all the presentations posted. Most of it is for library staff, but those same ideas can be used for us writers as well. I used that old fashioned, outdated, and “extinct” form of communication, you know, the actually holding of another person’s hand and shaking it while I hold their gaze with my own and engage in small talk and witty conversation to build a relationship. I know, sounds crazy these days doesn’t it? 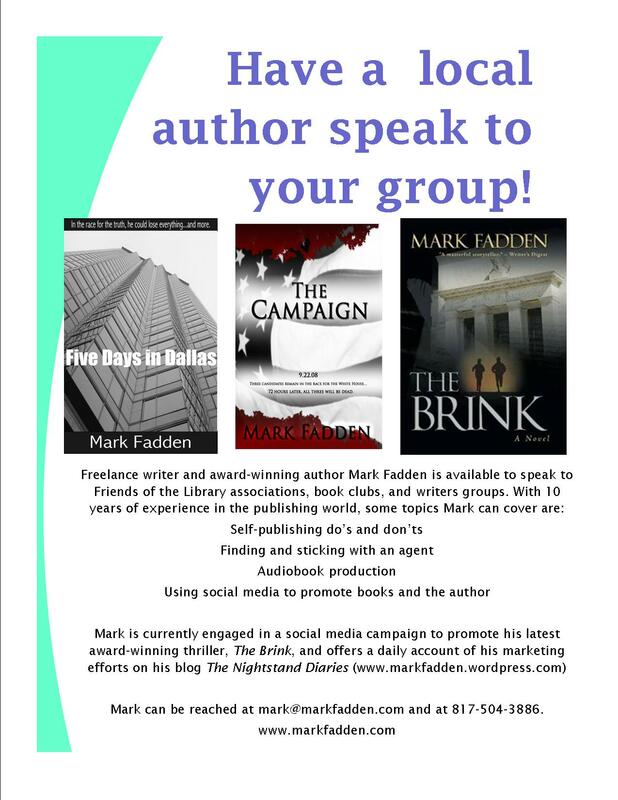 But I talked to 9 different representatives of libraries and Friends of Library groups that want to have me come and talk to them about my experience as a writer. That means that 9 meetings where I can sell books. Don’t forget about your local library when you’re putting together your marketing plan. They are a valuable resource. And I think most of them will still be around after 2020. Book signings are like kids – no matter how hard you try to make them turn out right, sometimes, for reasons beyond your control, they just don’t turn out the way you want them to. Okay, so that’s a little bit on the “epic” side of things, but what I’m trying to say is that sometimes book signings go bad. Case in point, my Hastings signing in Denton, Tx was not a success. I sold one book to a nice lady who wasn’t that much into political thrillers, but I told her how there were clues to the mystery in The Brink hidden in the front cover. Actually, they aren’t hidden in the cover, they are right there plain as day, but the important thing is that she thought that was cool. It wasn’t actually a failure because I must have passed out 30 bookmarks. That’s 30 people who may go online and preview it then decide to buy it, or by the ebook, or pass the bookmark to a friend who likes political thrillers. Case the joint better than I did. Hastings is primarily a music store that sells some new books, but also buys used books and sells them as well. Customers going there in a college town (University of North Texas is in Denton, Tx) are primarily college-aged, and want to buy music or a used book, not a full priced book by an author they probably haven’t heard of. I should have done my research better and I will next time I do a signing at an independent store. Ahead this week – a library parody of the Old Spice Guy (the power of viral) – and what does Amazon now selling more ebooks than regular books mean for us writers?